Back in November 2010 we wrote about the renovation underway at the two-story brick building at the southeast corner of 6th Street and Florida Avenue. What a great place for a cafe, we opined. Finally in July of last year, a restaurant called Shaw’s Tavern opened up in the space. Many neighbors expressed eager anticipation at the very rumor, mostly since Florida Avenue lacks a variety of decent sit-down options. The excitement was short-lived. The restaurant’s management ran afoul of the District’s liquor regulations when it allegedly forged an alcohol license to purchase liquor from suppliers. Just before opening, Shaw’s hosted several events during which they served alcohol without the a license. The Alcohol Beverage Control (ABC) Board, rightly outraged, refused to grant the license. Unable to serve alcohol, which is where restaurants make much of their money, Shaw’s quickly closed. New owners bought the business and have reopened the space for breakfast, brunch, and lunch. Shaw’s will finally serve dinner and thus expand their hours beyond the 4 pm closing when they get their alcohol license approved. We dropped by Shaw’s Tavern recently to sample the food and the trip was well worth it. The food was excellent and refined and the atmosphere was pleasant. 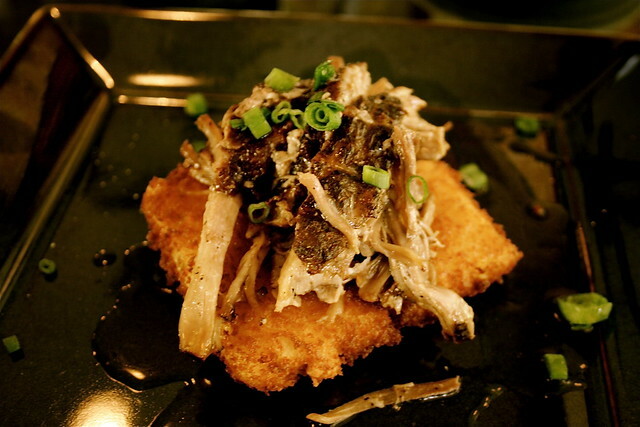 We ordered the house-smoked pulled pork shoulder (pictured above), which is served on a patty of crispy jalapeño-cheddar polenta and cider vinegar jus. The waiter described the item as “killer” so we couldn’t possibly ignore such an endorsement. It turns out the waiter was right. The pork, as he described, is smoked for 12 hours. It shows. The distinctly smokey and faintly tangy flavor of the tender shoulder meat makes the dish a signature item for Shaw’s. The pork tops a polenta patty, which is cripsy like hash-browns on the exterior, but creamy like skillfully prepared scrambled eggs on the inside. In fact the filling is not egg at all, but jalapeño cheddar cheese with polenta, making it a close rival to the pork. For dessert we ordered spiced chocolate pudding. 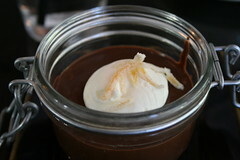 A dollop of cream and candied orange peel garnish the pudding. Don’t let that fool you, though. The pudding itself is not nearly as sweet as most American desserts and so the spice stands out. The interior of the restaurant provides an unusual variety of seating options. There are high tables for four people and larger parties. The bar itself is as wide as a full table and provides ample space for dining. The outdoor patio on the 6th Street side just opened with several iron tables and chairs. The inside also sports several couches with coffee tables, each equipped with a book on the Civil War to honor the restaurant’s namesake, Col. Robert Gould Shaw, for whom the Shaw neighborhood is named. There are few restaurants that really impress us, but Shaw’s Tavern was able to do it. When it opens up for dinner, we expect to return often. I went for the second time yesterday for lunch, after the Howard Theatre grand opening event. There were only a few other patrons at the time, but the food was fantastic. I had “The Pig” flatbread. It was loaded with prosciutto and serrano ham…yumm! Even though their hours are limited and they don’t have a liquor license yet, the food is great and the atmosphere is nice. Let’s continue to support this place as much as possible. Seeing as how Big Bear is ALWAYS crowded, maybe people should think about coming here during the day for coffee/lunch. I would hate to see the neighborhood lose this gem.